When we arrived at the silver cabin beside the Clyde we were met by Andy. (I think that was his name. I still have baby brain 2 years in though so names aren’t my forté anymore. I’m going to call him Andy anyway.) 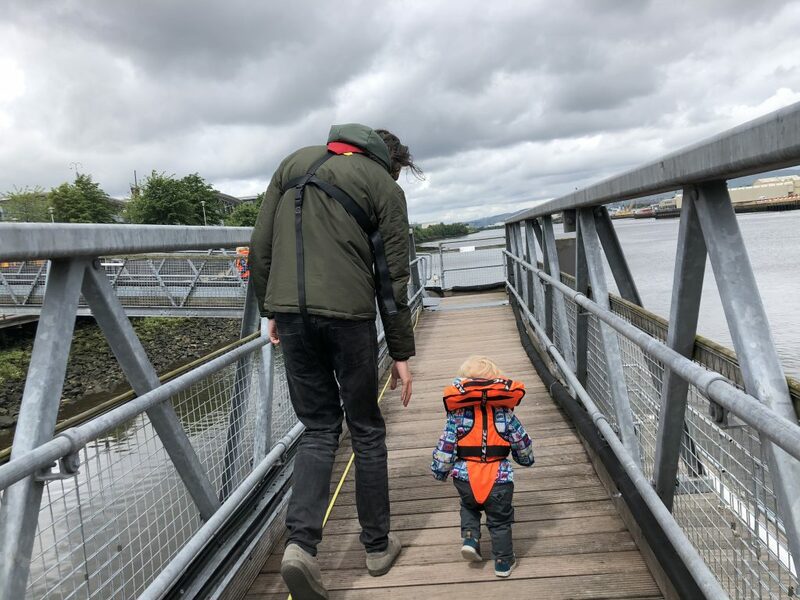 He gave us all some life jackets and a little safety chat, after which we were taken down the ramp pontoon thing (technical term…) towards the boat. The speedboat had 6 double seats on it, each with a handlebar in front to hold onto. The seats are soft benches that you have to straddle; helps with balance I guess, so you don’t fall off! Husband and I took a kid each and sat them up in front of us. We passed the Science Centre and the Riverside Museum on our way up the Clyde. We slowed down at both to get some photos from the water, but we whizzed up the river the rest of the way. 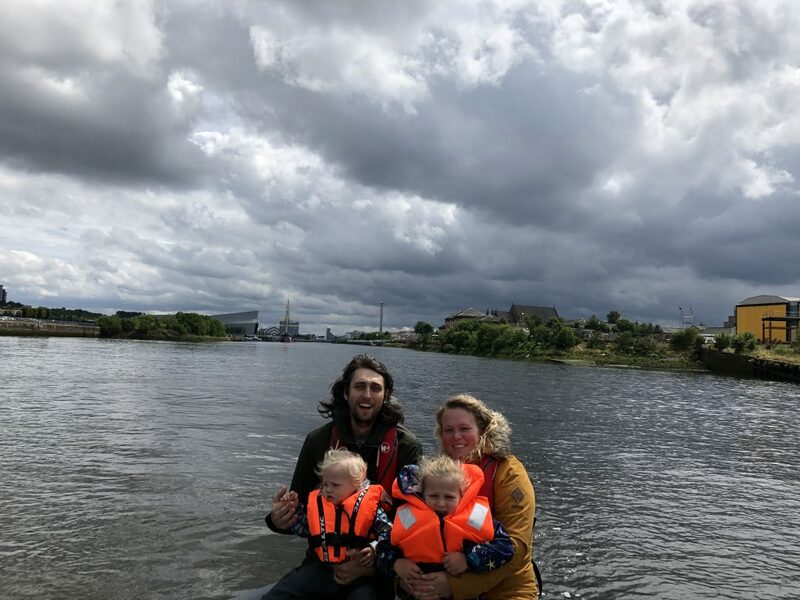 It took maybe about 10 minutes before we arrived at Braehead, where we docked at the pontoon just out the back of Krispy Kreme. We all got off the boat and headed up the ramp away from the water. Andy told us to come back in about 40 minutes to get ready to head home. The trip home was just as speedy! 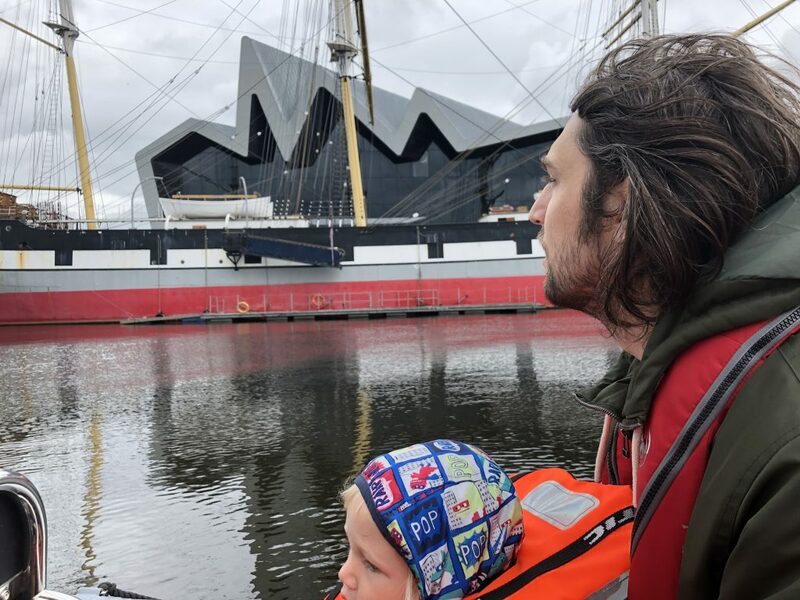 Instead of heading straight back though, our driver took us up the Clyde a little bit farther past some of the bridges to see a tiny bit more of Glasgow from the water which I really enjoyed. We also saw folk zip-lining across the Clyde outside the BBC building. We had about 40 minutes in Krispy Kreme, just enough time for everyone to choose and eat a doughnut, and for us adults to have a cuppa. 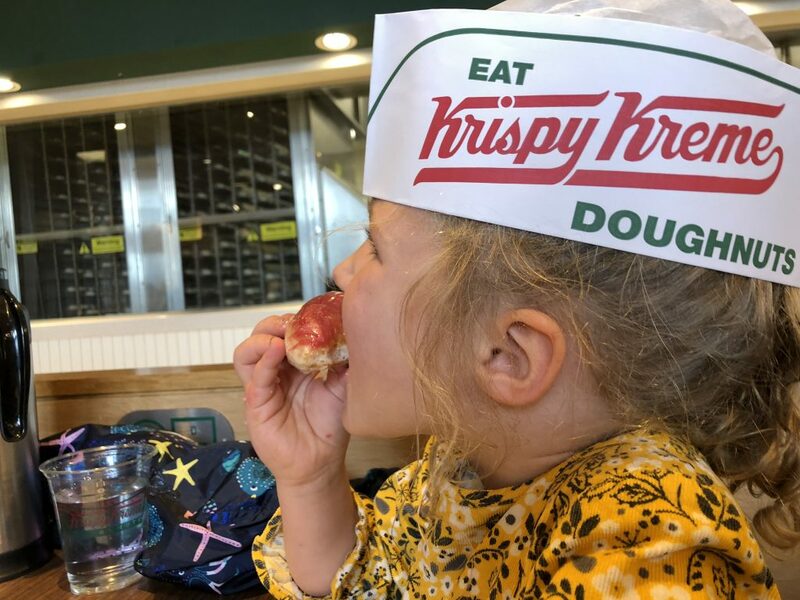 I mean, we were there to eat doughnuts, so the kids definitely enjoyed this part! 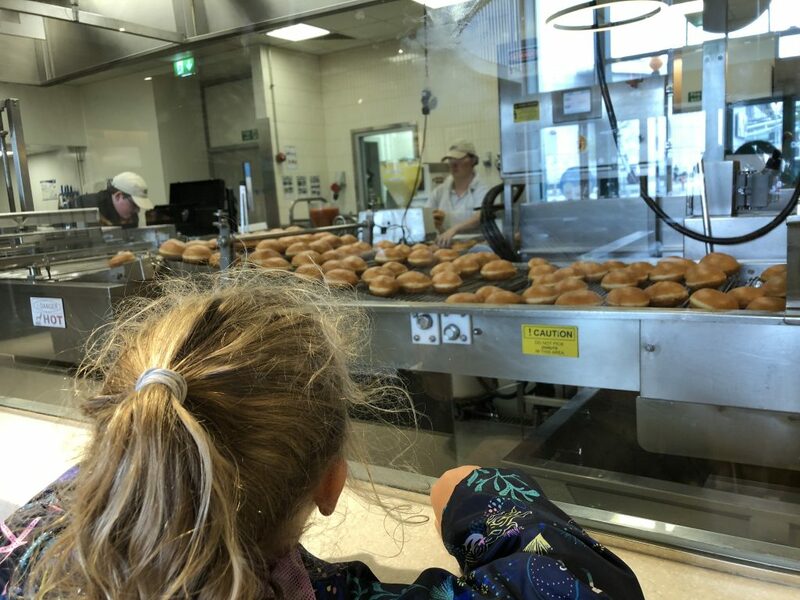 They also were totally mesmerised watching the journey a doughnut makes through all the machinery from a squidge of dough to a fully cooked doughnut. Children are welcome on board and get their own special life jackets. The pontoons are wheel friendly. 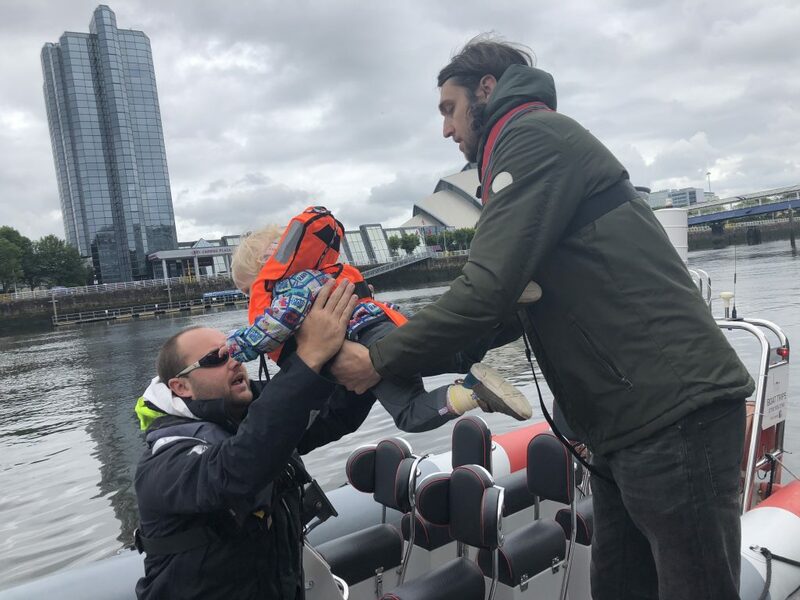 You have to be able to get onto the boat from the pontoon, but the skipper was very helpful with passing the little man between us! We didn’t bring a buggy. It didn’t look like there was space on board for one. I’d check before you decide to take one. Trips run daily between April and October. The rest of the year they run less frequently. Prices have gone up this year and it costs £15 per person. (It was £36 for the three of us last year. The little man was free. I’m not sure what age they start to pay at, but he was just 1 at the time. I’ve emailed to find out so will share when they get back to me). 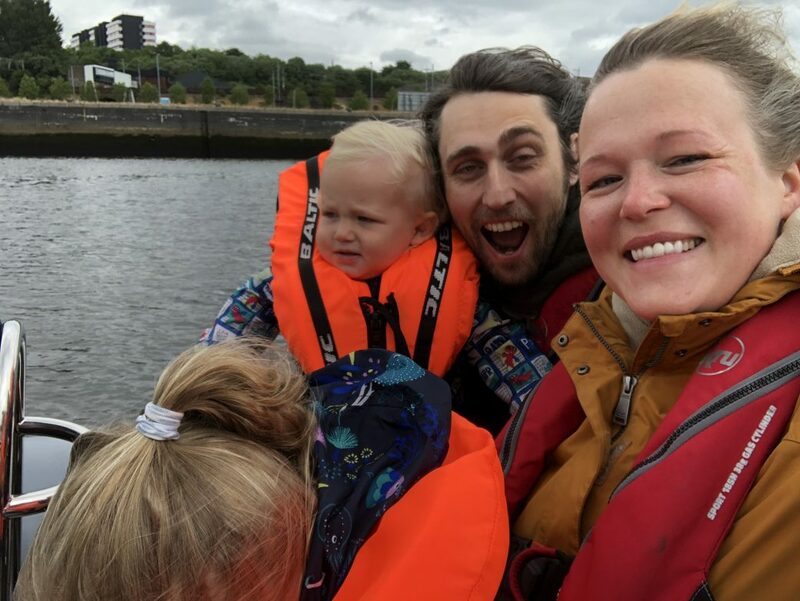 Our speedboat trip up the Clyde was exhilarating and seeing those bits of Glasgow from the water was really nice. 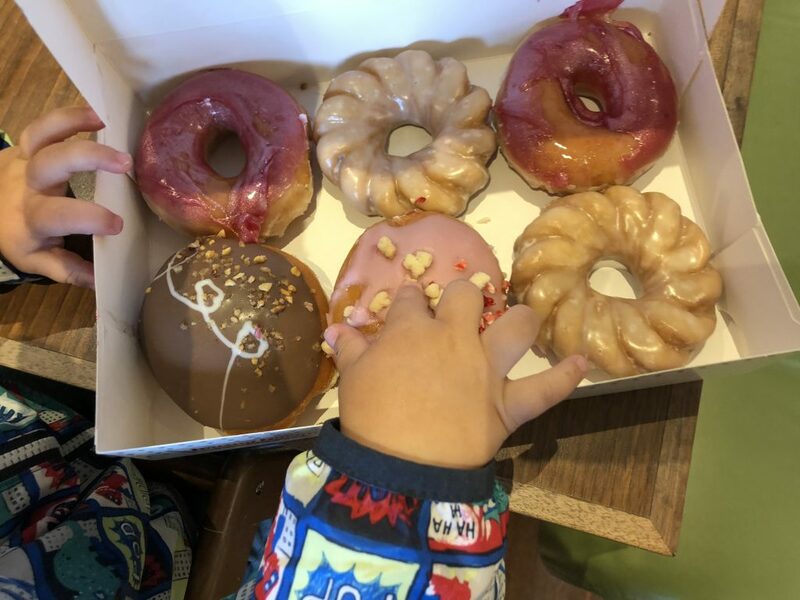 The trip was short enough that the kids didn’t get antsy and the pit stop for doughnuts in the middle was perfect. Even the husband was enthusiastic about it and told me how much he enjoyed it. Which meant he really enjoyed it, because that level of enthusiasm almost never happens. It was great fun! 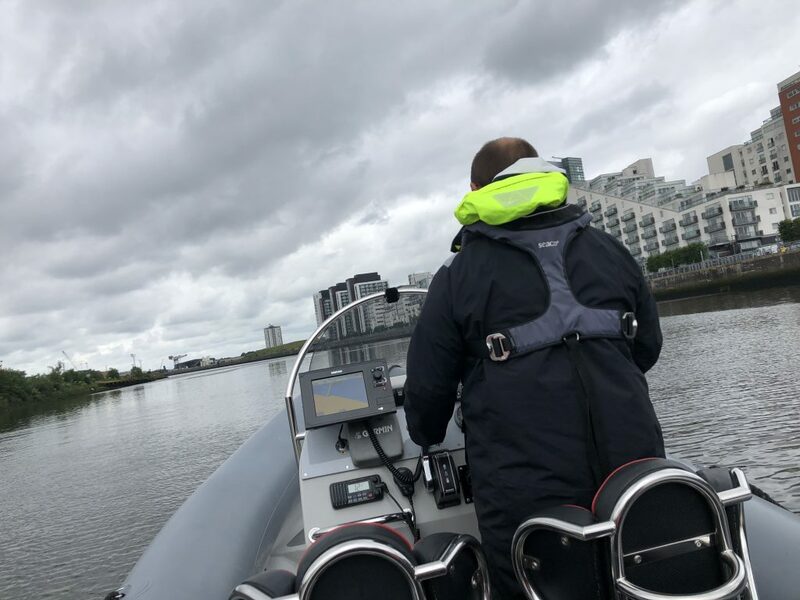 Powerboats Glasgow is located at The Silver Cabin outside Glasgow Science Centre, 50 Pacific Quay, Glasgow, G51 1EA.